off some mighty fine trees. 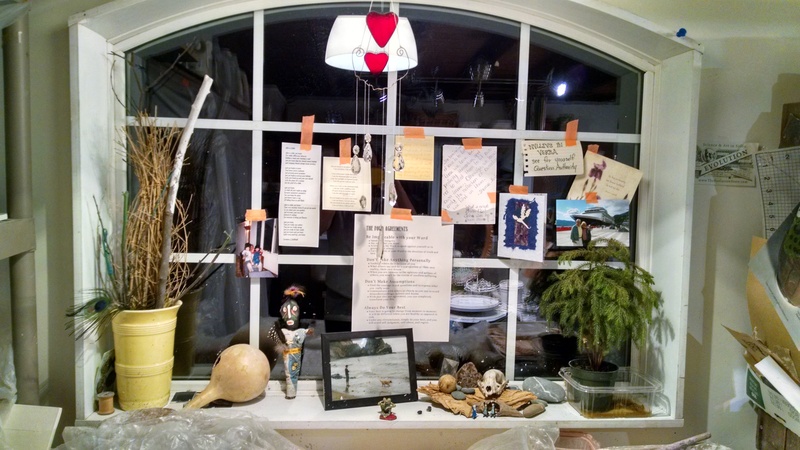 In my studio, I have a window that I have collected some items to remember John by. After a while, I will probably take some of them down and move them. I don’t want it to begin to become a shrine. The voodoo doll, he bought the summer he worked at Zion National Park and went to California to see a cousin, who took him to Mexico. The photo of him is when we took him to Oregon, a year ago this week. There is a rock on the shelf that I dated 8-22-2013 Walking with John, Grant’s Pass, Oregon. 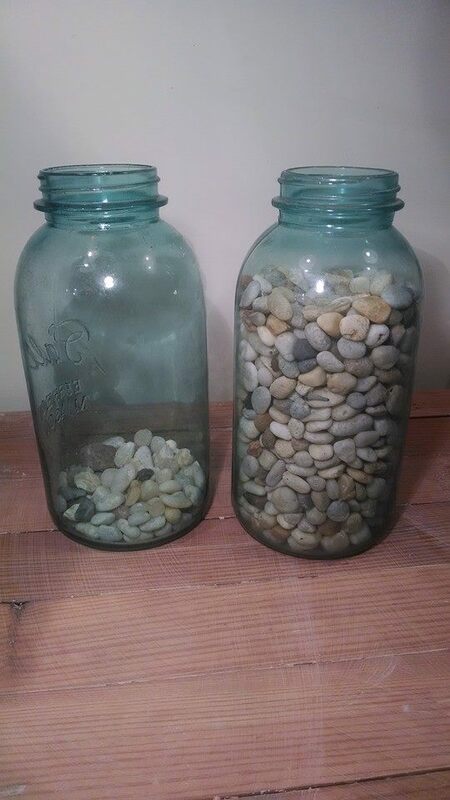 Tomorrow is the 22nd of August and that rock will go into my jar to add to the 1000 pebbles that I am marking the 1000 days to Acceptance. Today is day 165. The poems that I have taped onto the window have given me words to read to help me through my days. They are positive thoughts. They may go away after a while and I find other positive thoughts to take their place. Some days, I don’t look at them, while other days, I read them all. Today, I thought I would share them with you and to also share some insights from a book that I have been reading. Trying to understand the differences in how I, and others are dealing with our new normal. Right after John’s death, we received a little over a hundred cards and letters of condolences. Many of them had cliche’ messages, many people didn’t know what to write so they let the card be the message and simply signed their names. Some of the cards were very pointed and told stories that really helped us to feel supported and loved. One letter we received complimented us on our parenting and that, while they didn’t know John, except to watch him play baseball in high school, they did know us and that if we were any indication, John must have been an incredible young man. Many remembered time spent with John. I have also been reading a book by an Episcopal Bishop, “Why Christianity Must Change or Die” by John Shelby Spong. As an atheist, I get really frustrated with comments surrounding my son’s death and am trying to find words that will be inspirational to me but will help me to be a critical thinker. This book, written in 1998, discusses all the frustrations that I have had with religion and the superficial aspects of it in terms of today’s society. After, the death of my son, I have struggled with how religion is playing a part in how others are dealing with their grief. I am trying not to be judgmental about someone else’s grief. Each person has a right to their own belief systems but religion and god have nothing to do with how I am dealing with my grief. Critical thinking is the basis of this book and Bishop Spong’s advice is to try to find new answers to many of the practices that are out of date from biblical times. He takes the scriptures apart and points out the histories behind them and how the world was very different than what it is today. One of the reviews on the back of the book says that …”he sounds a rousing call for a Christianity based on critical thought rather than blind faith, on love rather than judgement, and that focuses on life more than religion.” I want answers. I don’t want to just think that my son is floating about. With space travel, we now know that the earth is not flat, as what was thought, when the bible was written. Women certainly play a completely different role now than they did in biblical times. Embryology was not even known until the 1700s how a woman’s egg gets fertilized and that during biblical times, she was just property. Men had more than one wife, they had slaves, they were supposedly told by God to go in and kill people. These are just a few of the topics that Bishop Spong addresses. Prayer is something that he says we need to take a hard look at. How can some prayers be answered while others seem to go unnoticed? Again, critical thinking is something that we need more of. We now have weather radar that can tell us that storms are not part of God sending us signs. We know that space is growing larger and larger with more and more new discoveries. We know that we evolved from a fish. Much of the world was not even know to exist when much of the bible was written. I would highly recommend this book to all christians. I need to point out that Bishop Spong is a believer but calls himself a believer in exile. As an atheist, I respect the christian views to love one another, have respect for all and to care for others who are less fortunate than ourselves, but I think, like Bishop Spong, we need to revisit many of the stories in the bible and add history and realistic science to the stories, putting them into a new perspective to see if they really are words that we want to live by and to understand just how insignificant we really are in the universe. I think that inspiration can come from the beauty in the world around us and from the words that we send and share with each other. I can’t get that inspiration from the Bible and I don’t believe in a supernatural being. So, below is some of the simple inspirations that I am looking to each day to guide me through my day and to help me resolve my grief. The 125 cards that we received were all very moving in each of their own ways. The sheer numbers of cards gave us the knowledge that we are loved and are being thought of at this difficult time. In addition to the cards, friends have made us aware that they are there for us, whenever we need them. Some people sent money, not knowing what else to do. That money has been used to put a memorial garden in our yard so we can remember the thoughtfulness of those kind offerings. Being private people, we have accepted some of these invitations and not others. That isn’t to say we don’t appreciate the offers, we just need to deal with small bits of our sadness, sometimes alone. There is a scholarship fund that is being set up in John’s name through the Shenandoah Community Foundation and when it is complete, I will post about the details so that some other adventurous individual may have the opportunity to experience life fully the way that our son did. Thank you to each and everyone that has reached out to us. Inside a card from Walter Elliott: Walter was a friend of a friend who went kayaking several years in the early summer with John, Herb and several other guys. I never met him but I feel this really says that he knew John very well. I share in the sadness from John’s death. He seemed to enjoy so much. The simple things that others discard or take for granted. Watching him eat leftover food or recycle it into a delicious snack was a pleasure. He made the task of building and tending a campfire into an expression of art. May your grief be lessened by the gifts he gave us in life. A poem that my friend Claudia sent me: Claudia sent me this as a way to start my day. The stability of earth and the firmness of rock. I don’t think John is in these things but the poem is lovely and the change that I would make to it is that I think John is now stardust rather than the starlight at night. With his ashes being scattered all over the country, I think that stardust is more fitting to his situation. I am a thousand winds that blow. I am the diamond glint on snow. Mona also wrote…. what a great thing that John was his own man! or even a red, red rose. Later a puzzle worked and fit seemed right. But, now I think I know. sewn together with thread from our souls. And finally, something that I have had on my wall for a while that I find inspirational and try to follow it…. I don’t always do this, but can only strive to do these things.